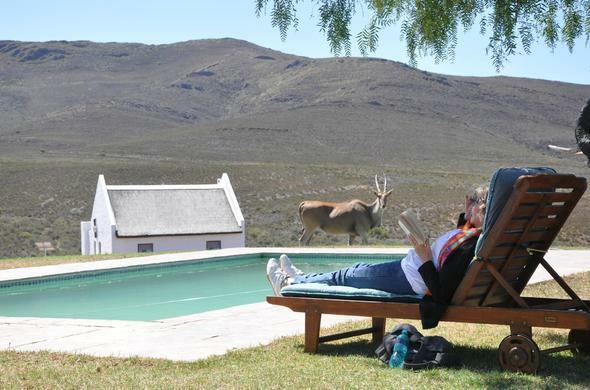 African Game Lodge is an authentic wildlife experience near Cape Town. It is based in Montagu, Klein Karoo, Western Cape. Your journey to African Game Lodge is the start of unforgettable memories and experiences. Situated in Montagu in the Klein Karoo of the Western Cape in South Africa, this journey provides guests with spectacular scenery, mountain passes and some famous wineries. Montagu is one of the most unique agricultural villages in the Western Cape, and offers a wonderfully rural atmosphere. This area is ideal for guests in search of some peace and tranquility, not to mention the beauty of Mother Nature in all her glory. Follow the N1 through to Worcester from Cape Town. Turn right at the Worcester/Robertson turnoff. Turn left onto the R60 to Robertson and through to Ashton. Continue straight which will become the R62 to Montagu. Approximately 1Km (0.62 Miles) outside of the town you will see a signboard indicating to turn left onto Talana Road for African Game Lodge. Continue for approximately 16km (9.92 Miles), until you reach a sign for Driekuilshoogte Pad- Turn right here at the African Game Lodge Sign. Continue on Driekuilshoogte Pad for an estimated 10km (6.2 Miles) to the gate of African Game Lodge. Travel through the gate and continue on the road for approximately 3km (1.86 Miles) which will lead you to the reception. Cellphone coverage is lost on this route.